People with dementia are often very fit. They need to move about like all human beings. De Hogeweyk or Hogewey is a gated model village setting in Weesp, in The Netherlands. It is notable because it has been designed specifically as a pioneering care facility for elderly people with dementia. The major advances achieved by the approach of all-day reminiscence therapy at Hogewey, compared to traditional nursing homes, is that the residents with dementia are more active and require less medication. Carers, doctors and nurses work around the clock to provide the 152 residents the necessary 24-hour care. Inside the complex, there is a park with a pond, a long boulevard, several squares with cafés and restaurants, as well as a theatre square. There is enough space to allow for the pronounced urge to move typical for the illness, and there are plenty of areas for communication and social exchange. Although people suffering from Alzheimer’s disease are often still very fit physically, they have problems with memory and mental capacity. They feel disoriented and can’t manage without help. Here they can move about freely on the grounds without having to worry about not finding their way back home again. A total of 23 apartments are provided on a gross floor space of 12,000 m2. The row houses with clinker brick facing are no more than two storeys high and contain one double room and seven single rooms each. 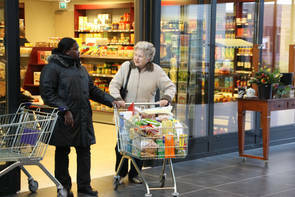 152 senior citizens live in ‘De Hogeweyk’ at the moment. Healthcare presents us with a design challenge, and the current model is not sustainable. So what do we do? What does next look like? Can we create a higher performing healthcare system at a much lower cost that delivers multiple benefits and outcomes. The answer is yes, its just that we need the right world view, and purpose. Patients Know Best, INS, Downe Hospital and De Hogeweyk in Holland demonstrate this potential. Below a CNN documentary about De Hogeweyk and its remarkable success.